These 10 Local Restaurants Do Food Deliveries To Tuas! 10 Restaurants That Are Willing To Deliver Where No Man Has Delivered Before - Tuas! Food deliveries have made our lives so much easier. Feeling lazy? Get food delivered. Can’t tear yourself from that Netflix marathon? Get food delivered. Here in Singapore, there are several companies dedicated to delivering food to our doorsteps (what a time to be alive!). While most of us are pretty lucky to have these food delivery services at the touch of a button, there are certain areas where most food deliveries do NOT go to. Tuas for example is one such area. While those working in Tuas only have access to a limited number of food delivery services, these 10 restaurants definitely do food deliveries! 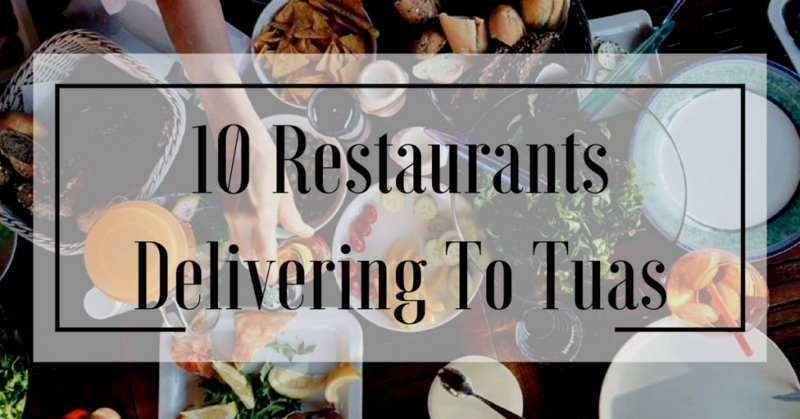 So for our friends working way out in Tuas, here are 10 restaurants that are more than happy to deliver food to your offices! Kim San Leng group owns about 30 coffee shops all around Singapore, so odds are you’ve eaten at one of them before. Good news they now do deliveries. No more hankering for Chicken Rice or Fishball Noodles! Get all your favourite coffeeshop eats like Economic Rice, Bat Kut Teh and Prawn Noodles delivered to your doorstep. With these 10 mouthwatering food spots now offering deliveries to Tuas, you never have to leave your office to buy your favourite eats again! Get your orders for Kim San Leng’s coffeeshop favourites delivered HERE! Craving something sweet? Rainbow Lapis has got you covered. Offering traditional snacks like Kueh Lapis (of course), an assortment of Tarts, Fishball Keropok, Chiffon Cakes and even bottles of kaya and chilli! Selling most of their treats in bulk, throwing a party just got a whole lot easier. Put in your delivery order for Rainbow Lapis’s traditional snacks and desserts HERE! With a name like SWAG where can you go wrong? This food outlet serves up some really healthy eats like their Signature Salads and Wraps. Looking for something healthy and sweet to wash your lunch down? Look out for their assortment of cold pressed juices. The best part? You can even craft your own salads and wraps! Get your orders for SWAG’s healthy salads and wraps delivered HERE! Sum Yi Tai is pretty known for their roof top bar and their 1980s retro oriental themed decor but don’t think they’re all style and no substance. Sum Yi Tai is having a Lunch Express delivery for those who just can’t tear themselves away from work. On the menu? Old school Chinese favourites like Crispy Roast Pork Belly and Sliced Luncheon Meat served alongside either rice or noodles. Get your Sum Yi Tai’s old school favourites delivered HERE! Looking for something hearty and healthy? Look no further, cause Ninja Bowl is offering just that. Known for their Bowls which are filled with all the good stuff (vegetables, carbs AND meat), Ninja Bowl has some amazing looking and tasting Bowls on their delivery menu like 24 hour braised beef and pan seared seafood! Get your orders from Ninja Bowl delivered HERE! What do you get when you put Subway and a whole lot of melted cheese? You get Yellow Submarine. Bring your appetite because this place offers up huge meat filled Philadelphia style sandwiches. Paired with their Torpedo Fries (french fries drenched in cheese), you’re gonna be stuffed after your meal! Get Yellow Submarine’s sandwiches delivered HERE! Like all things Korean, Kimbap has become pretty trendy here in Singapore. Kimbap is similar to Japanese sushi rolls except with a lot more vegetables and heartier meats. Korean food stall Seoulroll specializes in Kimpbap, so expect your favourite Korean dishes like Beef Bulgogi in easy to eat sushi form! Get your orders for Seoulroll’s kimbap delivered HERE! What’s better than having some Thai food in the comfort of your own office? Nothing really. GREAThai offers up Thai favourites like Pineapple Fried Rice, Tom Yum Seafood Soup and Phat Thai Seafood. If you’re having an office get together get the Set Meals which can feed 2,3 and 4 people! Get GREAThai’s traditional Thai dishes delivered HERE! Park Bench Deli (PBD) is no run-of-the-mill sandwich shop. Known for their huge decadent sandwiches PBD is serving up some international favourites such as Kong Bak Bahn Mi and Chicken Katsu. If you’re looking for something a bit more western, order the Grilled Cheese or the Turkey RBC! Get your orders for Park Bench Deli’s decadent sandwiches HERE! If you’re stuck at work and you’re craving for sweet Japanese desserts, Delicius Pasticceria has got you covered. Carrying a wide variety of Japanese desserts, have your pick from an assortment of Japanese sweet treats (whole and sliced) like Mont Blanc, Mille Feuille and Chantilly Cake! Get Delicius Pasticceria’s sweet cakes delivered HERE! Also Read: We Hopped On The Makan Bus And Didn’t Wanna Get Off – Here’s Why!